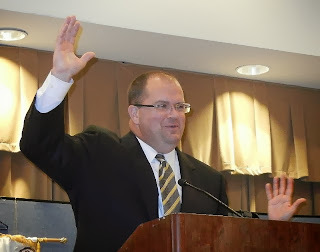 Dec. 17, 2013: Rotarian Bill Hall and his family hosted our annual Holiday Luncheon at Hall’s Chophouse on King Street. It was a packed house! Rotarians and their guests enjoyed a spectacular lunch while enjoying holiday music. It was a festive event that got everyone in the Holiday spirit! A huge thanks to Bill, his wonderful family and staff for making this such a special way to celebrate the holidays! Gross Regional Product Growth from 2005-2011:26.2%. This number is well above the state average and similar communities in the Southeast. We are competing against 386 metros nationally. Earnings per worker growth from 2005-2011: 21.5%. High skill, innovative jobs are continuously being added, to include the grow ing IT sector and aerospace industry (Boeing). Regional Employment Growth from 2005-2012: 11.5%. This is double the growth of Charleston’s peer group. Exports Share of GRP, 2012: 14.5% or 3.9 billion. Charleston ranks among the Top 25 Metros in United States for Exports. According to the 2013 Regional Economic Scorecard, our future success depends on four (4) competitiveness inputs, which are: human capital, innovative activity, entrepreneurial environment, and quality of place. Human Capital: The Charleston Metro area is competing nationally based on talent. They reported that Charleston trended positively during the Great Recession. We need more highly skilled high school graduates with a focus on science and mathematics. Derreberry and Warner believe that our challenge areas are: Population growth, housing affordability and travel congestion. We have outstripped growth in the United States and are the second fastest growing metro behind Austin, Texas. Forty new people are moving into the region every day, with an anticipated one million people in the Charleston metro area by 2027. With this population growth, we now rank #68 with regard to congestion. Derreberry and Warner said that transportation infrastructure must be addressed in addition to the following sustainability factors: Education, Innovation, Talent. “We have fierce competition, considering that Virginia and North Carolina, in close proximity, are some of the most productive states in the nation. Thus, we have to focus on talent. The Charleston Aerospace Industry and IT workforce are among the fastest growing in the country. We have made investments in talent, with a long term pipeline of talent.” “Jack Jones at Boeing will tell you that they are making fifty year decisions and have to know that Charleston will have talent for the years to come.” This would not be possible without the hard work, knowledge and insight of Brian Derreberry and Steve Warner. 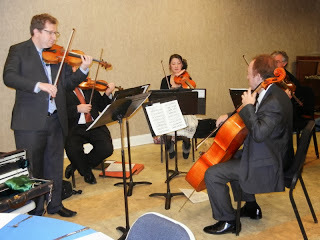 Dec 3, 2013: Rotarians were entertained by a string quartet from the Charleston Symphony Orchestra (CSO) at our meeting on Tuesday, December 3. Playing traditional holiday music before President John rang the bell got us all in the mood for the next of our very-close-together 2013 holidays and ready to hear a wonderful presentation from keynote speaker, Yuriv Bekker, Concert Master and Acting Artistic Director of the CSO. As an additional joy, Mr. Bekker and the string quartet performed one of the violin concertos, “Winter,” from Vivaldi’s much loved Four Seasons. Mr. Bekker’s resume as an internationally known artist is worth a trip to Google where you would learn that this talented violinist has performed all over the world. A native of Minsk, Belarus, Mr. Bekker is now a proud citizen of the US and has served as the Concert Master of the CSO since 2007. He also currently holds the title of Acting Artistic Director of the Symphony and is widely credited as having served as a driving force in leading CSO through some of its most difficult times to its current position as the premiere example of Charleston’s vibrant art community. Concert Master Bekker is clearly pleased with the successful innovation that CSO has introduced into its repertoire, noting the popularity of acrobats and other unexpected artistic combinations designed to ensure relevance of the symphony to our community. New fiscal policies have resulted in CSO being “in the black” and having one of the most responsible orchestra business models in the country. Rightfully proud of expanded community attendance and support, it was clear that one of Mr. Bekker’s passions is impacting children with the magic of music and the ability to use various instruments to create it. Noting that there is an unarguable correlation among math, science, geography and music proficiency, our CSO leader has implemented a multi-faceted education program to develop a love for, and possible skill for playing, orchestral instruments. CSO has reached out to the broader business community to develop collaborative programs for students that range from early classroom introduction of musical instruments by accomplished performers to high school competitions allowing promising musicians to “Share the Stage” with professionals for a real performance. Concert Master Bekker was especially enthusiastic about a new National Young Artist Competition for high schools students who send in videos of their work and hope to be one of 6 semi-finalists—and ultimately one of the 3 selected musicians—who will perform as a member of the CSO in a special concert.